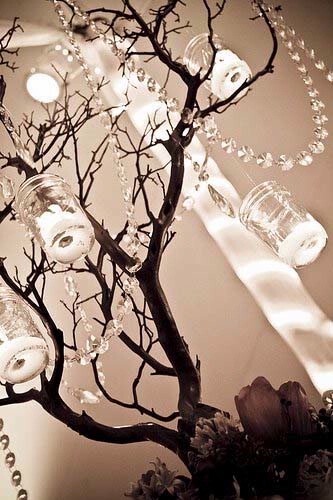 I know this is the wrong time to do a deep post when hot chocolate gets preference over tea and real paves way for dreamy, but I really wanted to talk about these branches that have quite taken the designers by fancy. 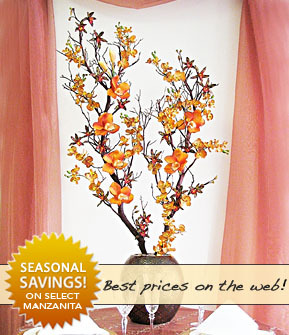 Manzanita branches are in fashion and I am wondering whether it’s here to stay. You know, of course barring some ideas that are surprisingly original, I’m a copy cat chic. I am hooked to blogs 24-7 and have been called names and adjectives for doing so. But it doesn’t matter to moi. 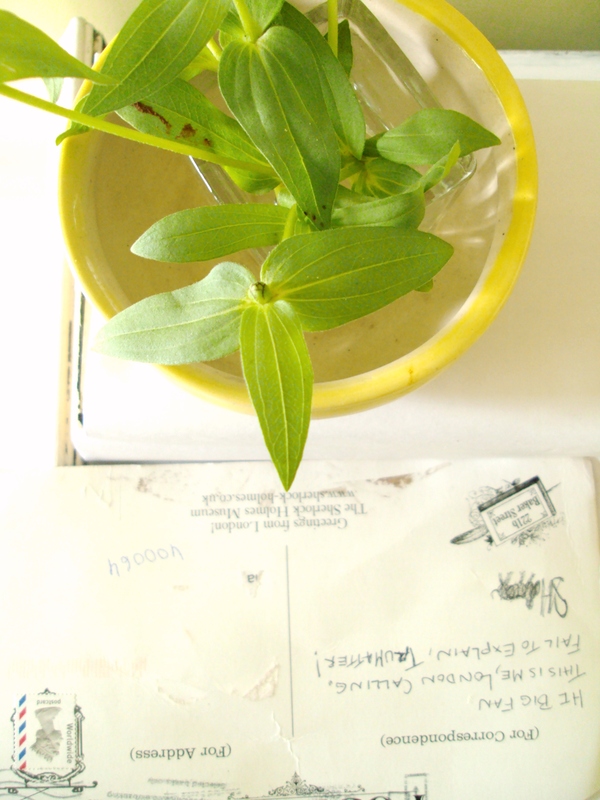 I am a complete sucker for fresh inspiration and DIY crafts that involves minimum expenditure. Hence, on one of those blog-looking-marathon when I saw these apparently very “in” Manzanita Branches and the fact that they are being sold at some exorbitant prices, worldwide, my brain pondered upon the most probable question: “Is it worth $349?”. The lowest is $48! Well, what exactly are we paying $349 for? A reddish brown shrub, devoid of its leaves and dressed according to occasion. Aren’t those our dry neighbourhood branches that the sweeper often throws away? Whoa. It’s only the looks. There is no other significance of the so hyped branch unless it has some medicinal properties that Im not aware of. The next probable question. If I’m to invest 349$ at all in a branch, would it be useful to me? Herein comes the question: is it a classic or a fad! Well, personally I do think a great looking branch is a classic. It can really never go out of place. If you have that kind of money to splurge on a branch, I’d say go ahead. Here comes the self proclaimed manzanita Tree reviewer’s final verdict. 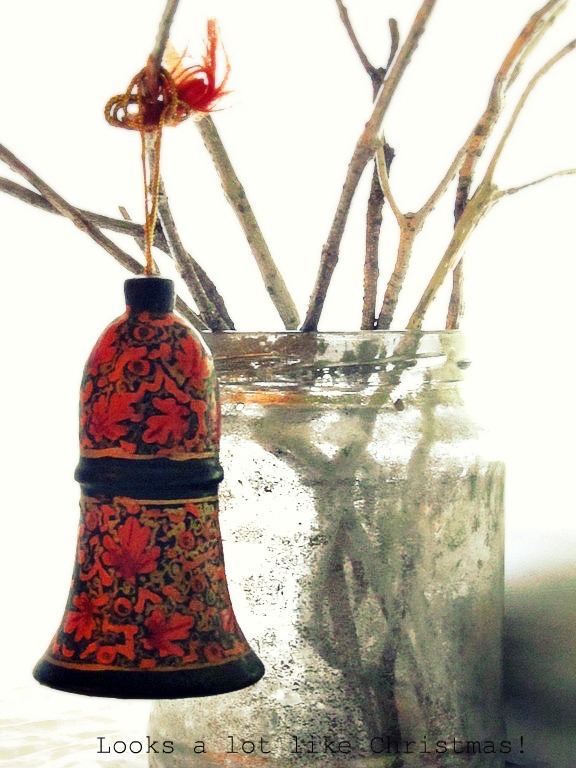 Pick up one of those as your centerpiece but before hitting a fancy store, take a walk through the wild side, would ya? Stroll around in the woods and you are most likely to find a tree absolutely free. Like I did. They are worth the show, but about the money I would like to be zipped. They are classics yes and not fad at all. Dress them rustic or coastal or sprinkle a bit of silver if you want and it can change your space to something that’s totally fashionable. But blings and chains on them might be a fad. Dont fall for it. It will lose charm. 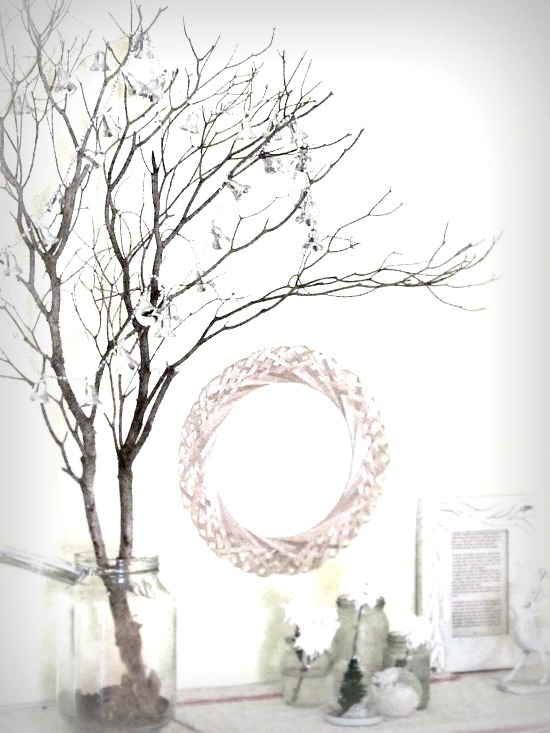 Also, get your hands on a bare real tree than fake, metal and already dressed ones. That opens up possibilities. Have a great week ahead if anyone’s reading. Hi Y’all! I hope you are all back from a wonderful Thanksgiving? You see Thanksgiving is not traditional to me although I’d love to take out time and thank: to people who matters to me and have brought immense happiness in my life, to my parents, to R for being a sweetheart and my best buddy, all those who read me and care to write back here, every comment is an inspiration to carry on and God, for giving me a life that’s (touchwood) beautiful. And having said that, anyone inviting me for a turkey dinner? I am all geared up for Christmas and so is my little, teeny apartment. I made a couple of mercury glass some time back and boy they look festive. I’m loving them every second, with everything. I wanted a centerpiece for my little end table and figured that my mercury jars would look pretty dainty with some silver twigs thrown in. 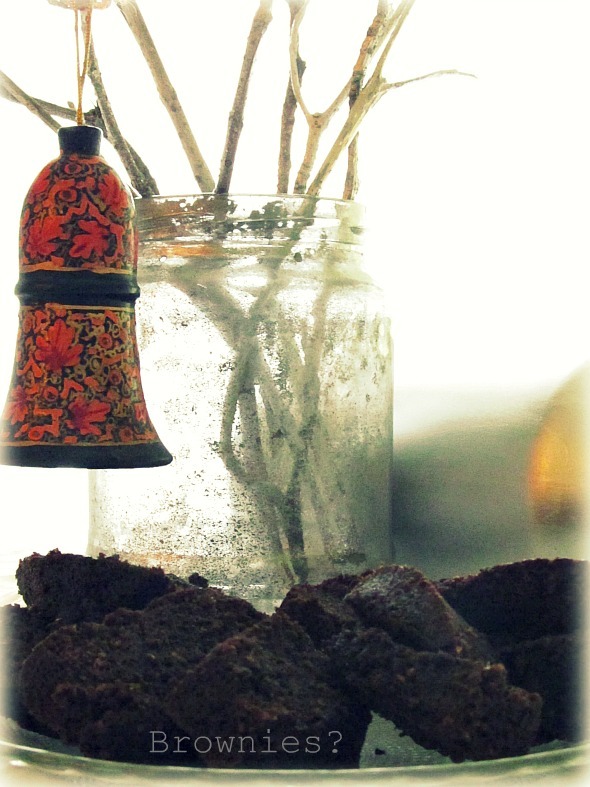 It was quite chilly outside so I thought some dark chocolate brownies would do me some gooey good. So they did! Munch on…they with their super chocolaty, calorie laden goodness mean no harm to your soul. Just to your waistline. Maybe! Preheat your oven to 350 degrees F. In a bowl, sift flour, cocoa powder, and salt. Set aside. Combine butter and espresso powder on low heat in a saucepan and heat till all the butter has melted. To this add chocolate and stir to a smooth mixture. Get it down from the heat, add both the sugars and keep aside. Whisk eggs and vanilla in a bowl until creamy, to this dump the above mixture, whisk a while and dump the flour. Butter an 8″ pan, line with baking paper and butter the baking paper. Pour batter and bake away for 30 minutes. I’m such a rude cook but who cares! Hah! If Julia could manage with throwing the bone somewhere round the corner, I think I can take this liability. Stay warm and Enjoy your weekend. What i’m loving: Teacups and Tabletops! This was how my table looked like when I welcomed mom and dad on Friday evening- they were to stay at mine for the weekend. It was 7 and I really didn’t know whether they would like to dine immediately or have a cup of tea first. Hence the mixed arrangement in gold and warm pinks: primarily because the season called for it and secondly because it also happens to be my mum’s favorite color. 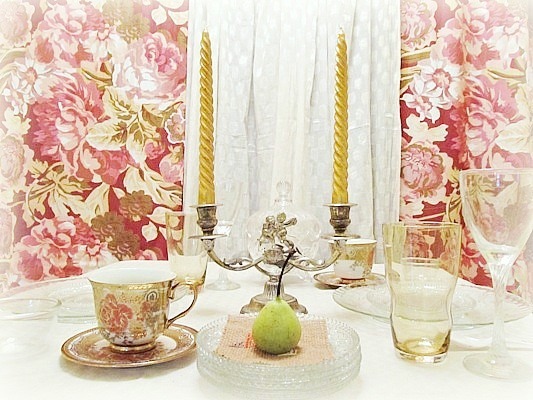 However, what I’m really intrigued to show and tell you is that most of the elements that went into giving this tablescape its warm and rich look actually came from the flea market and a dollar store. Now, howzzat? Here’s a closeup, you might like! I wish I could take a picture of its maker, but I shall update this post with the name. And here’s the cost/item. Such a bliss to the eyes these price tags are. My mom not only loved it but actually was very impressed that her genes have expressed themselves in me quite well. We had so much fun making old school breakfasts and traditional lunch. I’m gonna miss mom and pa terribly, now that they will be gone in less than 24 hours. Why do happy days always tend to end before we even realize its started? *sobs*. The tattered cupboard needed a coat of white! 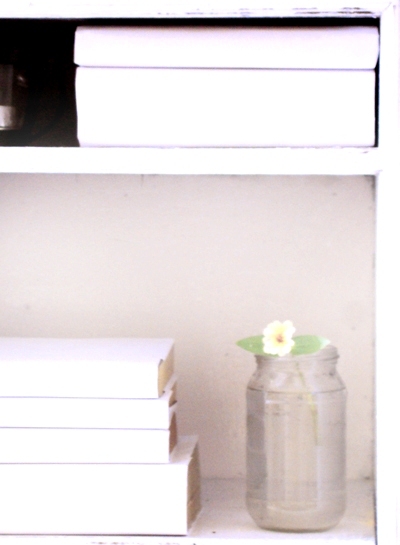 Recently, I came across a blog, where in I found the idea of covering books with white paper for a more serene and decluttered look. Well, it really was worth a try! Mr. Holmes found the top shelf for his new residence in India, where he will be putting up at secret hours for private consultancy. Kindly drop a message if you’d like an appointment. In case of emergency, just walk in. My sweet uncle from Germany visited England and stood on a queue to get this postcard for me, from 221 b Baker Street itself! This postcard is available no where else in the world (unless replicated) and is a limited edition that’s available only at Holmes’ residence. 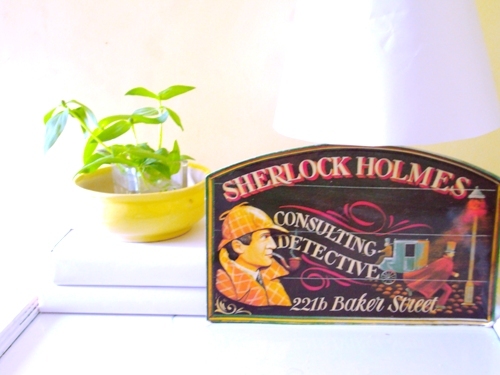 I am a die hard Holmes fan and you can understand how happy it made me. In fact to add a little Holmes-ly thrill he signed it off as Holmes himself! Let me tell ya’ it got me! Such a sweet, loving uncle he is. It means a lot to me! DIY: Chalkboard paint kitchen keepers! 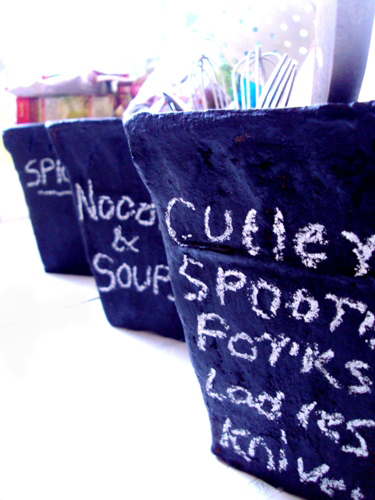 I’ve been very inspired by chalkboard wonders around the blogland. And hence, when I needed some stands to keep my ladles and a few handy things, I couldn’t think beyond three flower pots I bought for making a birdbath! I gave them a wash, a coat of blackboard paint and voila. That is it! There are lot of things that needs rearranging, but for now, I’m quite happy with this. What do you guys think?